My sons have two different donors. Different donors, different biological mothers. In effect, they have no biological connection. They are brothers, for sure. Cakie is learning everything he needs to know about how to be a child from his willing teacher, Cake. I don’t need to argue here at all about the fact that they are brothers. They are being raised by the same two parents in the same way in the same house. One of them looks a little like Obama. The other resembles Desi Arnaz. One is a tall skinny muscular reed. The other is a truck. Despite my efforts in selecting a second donor, the boys do not look alike at all. One might argue that many biological siblings do not look alike. True. They do act alike in many ways. They have the same very very high energy level. They both love to play outside. Trucker is far more into trucks and balls than Cake ever was. Cake likes music and cooking and superheros. I wonder what will happen when they learn that they have different donors? I worry that it might cheapen their bond. It may make them angry at us. As though we carried on some type of charade. Or that someone else will discredit their relationship as siblings. I worry, too, what will happen if either one tries to find their donor. Already, Cake has two donor siblings on the registry. Little girls. I haven’t paid the fee, so I have not contacted the parents yet. But I know they are there. And if Cake wants to find his donor and he cannot, I can offer up these half-sisters. There are no siblings on the registry for Truck. Could I pay the fee and put up a profile? Yes. Maybe that might make one come out of the woodwork. Maybe not. What if one of them has a donor who is willing to meet them or even have a relationship once they turn 18? While the other has a donor who has passed away, or worse, doesn’t even want to talk to him? I don’t worry about these things constantly or anything. They just, every once in a while, pop into my head. When Cakie was conceived, there were no open donors. It wasn’t a thing the sperm banks had convinced anyone to do yet. So when it was time to choose a benefactor for Trucker’s egg, I also chose a closed donor. It did it on purpose. I signed a paper stating that I would not look for the donor. I did this knowing that the baby didn’t sign anything. And if either of them want to look, they will have my blessing. And if I happen to stumble across a photo of a man that is his race, his height, his weight, his age and has long curling eyelashes, while I’m randomly trolling California acting agency websites for no particular reason, so be it. My biggest goal is to handle all of this with grace. I want to teach my kids that our family is one made from love. Love that is stronger than a spiral helix. It is like a triple-mega spiral helix made out of steel. Yeah. That sounds good. I often look for myself in my children. There are some things about one’s self that one does not want to see. Your faults seem so magnified when your children have them. Neither my honey nor I are good at making decisions. I always change my mind about things, then spend a good amount of energy regretting the fact that I changed my mind and wondering what would have happened had I not changed my mind. It is annoying. This is what my morning looked like: I asked Cake if he’d like to choose his own clothes, or if I should pick them out for him. He wanted to choose them. Then he changed his mind. I should choose them. When I came out with a striped tank top and brown shorts, he regretted not picking out his clothes himself. Then he went back and chose another shirt after bickering with my honey about if he was allowed to choose another shirt, since he did say that I could pick out his outfit. When it was time to go, he went to put on his blue sneakers. He was initially going to wear his new brown shoes that I got on sale. I told him if he did not want them, I could return them to the store. He wanted them. He wanted them, but he didn’t want to wear them. We said, that if he didn’t want to wear them that was fine, but we’d need to return them if he had no plans to ever wear them. So he put them on. I grabbed his visor, which he had wanted to wear yesterday. He got his helmet and scooter. Trucker, who had been waiting patiently while all of the shoe fuss was happening, already had his helmet and was ready to go. We left for daycare. When we got downstairs, Cake said he didn’t want to wear his brown shoes. Normally, I would have just said, “Oh well. Too bad, Kiddo.” But I noticed that they looked a little big. So I offered to go back up and switch for the blue. Of course now, I won’t be able to return them. The key didn’t work in the lock, so we walked over to the other door. (Trucker scooted.) When we got to the other door, Cake said, “I’ll wear them.” Ugh. Ok, so we set off for daycare. But first Cake stopped, got off his scooter, handed me his helmet and grabbed his visor. “I thought you wanted to scoot.” “No.” So we start to walk, but by this time, I’m really annoyed. And I don’t know why I was carrying his scooter. I should have made him do it. We cross the street. We’re standing on an overpass, on the other side of which is a very busy blind turn. Trucker bolts across the overpass. Cake grabs the scooter, and tries to start scooting without his helmet. In all honesty, I’m sure scooting without a helmet is fine. But we’ve pounded the helmet need into their heads pretty well, so I didn’t want him throwing it away. Trucker is half-way across the bridge heading for the dangerous corner. I whisk off Cakie’s visor, plop his helmet on his head and run after Trucker. Of course, he starts crying. When we got to the other side of the dangerous corner, Cake said through his tears, “I was just going to walk my scooter. I wasn’t going to ride it.” Oh. Well, I had to save your brother from death-by-SUV, sorry I was in a rush. Here’s the thing, if I went over this, many of the things we fought about were created by the parents. He didn’t need to wear those shoes. He didn’t. Why did we make him wear them? If we hadn’t forced him, I could be on my way to the store right now to get my money back. I’m actually strongly in favor of not forcing kids to wear clothes they hate. I just remember from my own childhood, how miserable the wrong clothing item could make me. If I hadn’t made him wear the shoes, the trip to school would have been a lot easier. And I could have still returned them. I know now, that they will probably not be worn again. Trucker survived the trip to school, happy as a sweet baby clam. When we arrived, Cake came to me and gave me a big kiss. And said he loved me. I hate bickering. I hate feeling like mornings like this could be avoided somehow. What is most frustrating is seeing that it is this fault that he got from his moms that is making us so annoyed. Yeesh. Anyway. I hope those shoes don’t hurt his sweet little feet today. One thing I like to do in the summer, like is too strong a word. One thing I do in the summer is try to clean out the house a bit and throw things away. I don’t like doing this because it involves making decisions about throwing things away or about where to put the things I decide not to throw away. I do like doing it, because aside from having a much more orderly house–or at least small section of the house–I inevitably stumble across things that I only stumble across when going through my closets. Some things were easy to decide. Lovely pottery from an ex-friend who decided not to be my friend any more because I’m gay, even though she knew about it for ten years went straight into the trash. That felt good. As did endless dry cleaning bags, photos which only included my best friend’s ex-girlfriend. Lots and lots of sweaters I never wear went into bags for donation (upon approval from my honey.) The dress I gave birth in… the dress I gave birth in? Yeah. That’s going back into the closet. I know. I probably won’t wear it again. But nor will anyone else. Then there are the treasures. 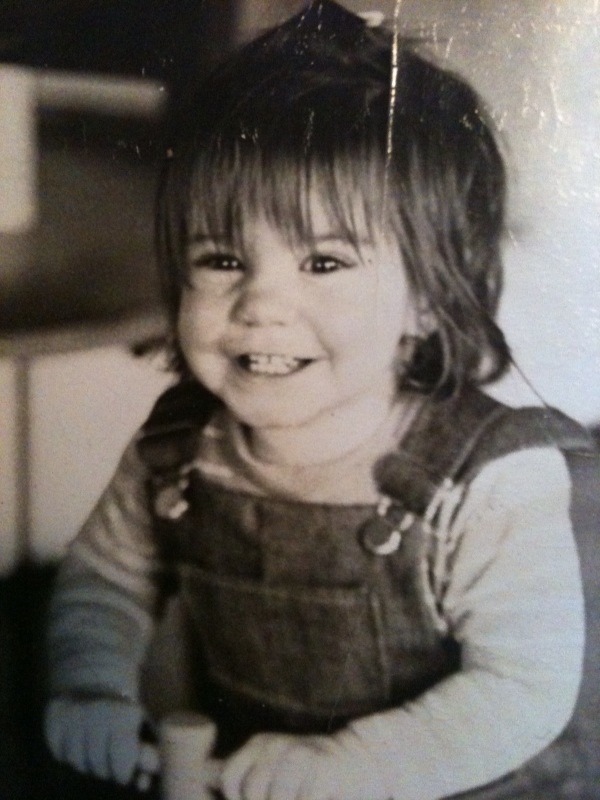 I found this photo of myself at 14 months old, in which I look very very much like my Trucker. I’m even riding something with wheels. I also found a photo of my best friend from high school. It is his first grade portrait for which his mother dressed him in the world’s largest red bow tie and a home-made knit red and blue sweater vest. I immediately sent it off to him via facebook. The photo was tucked into a teeny leather wallet, lined with red velvet, that also contained a four leaf clover once carried by my grandfather. I found a card entitling my grandfather to play golf at Oxford University Golf Club until October 1, 1930. And proof–PROOF– that I did indeed pass the American Red Cross beginner swimming course of instruction on July 23, 1982. I found a copy of a speech sent to me by James Howe, author of Bunnicula and Pinky and Rex. I remember seeing him speak at Teacher’s College and being very upset/inspired that I had not been writing. He also declared to the crowd that he was gay, which seemed brave to me at the time. I still skirt around it sometimes, especially in front of lots of teachers I don’t know. So, I’d written him a letter thanking him for the speech, and for inspiring me to write. He wrote me back, and took the time to print out and sign a copy of the speech. He’s good people. If I throw these things away, how will I ever stumble across them the next time I clean out the closet? Hmmm? So now here I am. The bottom of my bedroom closet is clean and empty. My front hallway is full of stuff to throw away or donate. Right in front of my closet door is the pile of treasures. Where should I put them? Me Time. I Am Not Ashamed to Have It. Earlier this week during the 100+ heatwave we had here, I went to a matinee of a so-bad-it-is-almost-good summer movie. 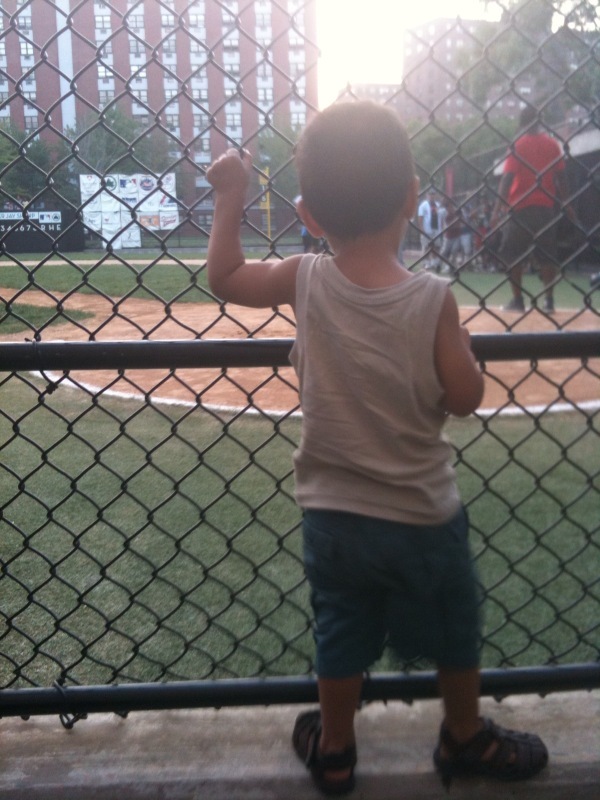 Standing in front of me was a woman who lives in my building, who I know from the playground. Her three-year-old son was doing the mommy-arm-pull sway on one side of her. Her four-year-old was jumping up and down, taking her other arm with him. We were both there to get out of the heat. She is a stay (and work) at home mom; a very down-to-earth, friendly, calm person. She looked around for my sons. They were not there. I told her I was going to see Grown Ups. She was going to see Sesame Street. She said she’d live vicariously through me. I felt just a slight twang of guilt. But mostly, I felt like I’ve made some good choices. When I was little, we stayed home during the summer. But we had a house with a big yard and friends in all of the adjoining yards. My brother and I spent much of each day, every day outside with our friends. Inside, I’m sure my mom was cleaning the house, doing the laundry, and sometimes kicking back with a cool drink and a good book. She was always there if one of us scraped a knee, or needed a cool drink. My mom stayed home with us until I was six. After that, my teen-aged cousin came to stay with us to watch us during the day while my mom was working. Neither of them were standing there watching us play all day. Which is basically what New York moms have to do if they live in an apartment with no outdoor space. There’s a whole lot of talk about stay at home moms vs. work outside the home moms. As you well know, for some it is a choice to do either. Some do not have a choice. If we wanted to keep our large Brooklyn apartment, we didn’t have much of a choice. I wanted to stay home with Trucker, but I chose to keep our lifestyle. One in which both moms work full-time outside the home in service jobs. I’m a teacher. Their other mom is a social worker. Neither job is one we could do from a home office. I suppose we could have afforded for one of us to stay home, if we slashed our budget. But we hope to buy a house in Brooklyn. And the truth is, when I got back to work after maternity leave, after much anger and trepidation about returning to the work force, I found myself to be happy. Those women who choose to make the sacrifice (I say that because it often is a financial sacrifice) to stay home, have made that choice for strong reasons, I’m sure. Here’s where I’m sure people are going to get all judgy on me. I’m going to share it with you because it is my choice. It reveals me as totally not an attachment-parenting person, even though I get a lot of the ideas behind attachment parenting. See, I have the summer off. But I choose to send at least one child to daycare every day. Yeah. That is my choice. I keep one child at a time once or twice a week. The other days are mine. Mine all mine. Why? Because I can. Because I am also a person who needs time to play. It means I can go shopping for a birthday present for my babies without hearing any of my own children beg me to buy them a toy. I can work out. I can get my shanti shanti on. I can have uninterrupted lunches with friends I haven’t seen in ages because I’m always at home with my kids at night. I’m going to paint our apartment and sell a bunch of baby stuff and clean out all the closets! It means I can do laundry and shopping during the week, so on the weekends, when my whole family is home, we can focus on playing and having fun together. It means I can use the summer for its true teacherly purpose… that is to recover from all of the energy I have spent on other people’s children for the past ten months. Me in June is not pretty or nice. It is wiped out tired cranky old beeotch. I will not subject my kids to that. They like their daycare. They both have many friends, wonderful caregivers, and lots of rollicking outdoor play. I also get to spoil each of my boys. They get a full day of all mommy all the time. I chose something that that particular boy will love to do. (And we can afford to do things like go to Coney Island, visit zoos and museums, and take classes, because both moms work.) I also do something errandy, so they aren’t left out of all boring day-to-day stuff. One needs to build up stamina for the mundane. I know some people think it is odd for me to not want to have both children with me all the time. And when they get older, I probably will send them to a summer camp, but also have long stretches of summer with both boys home. And I do have the two weeks with them both at the end of each summer when daycare is closed. But this is my choice. And this is why I love being a parent. (Unlike, apparently, masses of other folk mentioned in a recent NY Magazine article.) I love being a parent, because in its current form, I get enough time with each of my kids and enough time with myself. You are going to be two years old on Sunday. Never mind the fact that you have looked like a two year old for the past six months. You have all of the passion and strength of a two year old already. You are constantly exploring your world, and finding dangerous things, which as your mother I am obligated to remove from your hands. This often ends in a fists-clenched, floor kicking scream fest. I don’t blame you. I do not like when new and exciting things get yanked from my grasp either. You don’t look out the window at trucks as often. You do love your toy trucks. Especially if you can hook one vehicle on to another. Awesome. Another trick you do is to fill up the back of your dump trucks and spill them on to the floor, or balance other cars and trucks onto the back of a larger truck. After a recent weekend trip to the beach, you have widened your horizon to include boats and planes. While we are in the car you still gladly point out each truck, taxi, bus, and sometimes even car that passes us. If you happen to spot a river or ocean out the window, you scream “WWWWAAAAAAAADAAAAAH.” It sounds a little unsober. I love it. Everything your older brother does or says, you do and say. Sometimes I can’t handle the cute. If Cakie strikes up a conversation with one of our neighbors on the elevator, you will just start talking as well. Never mind that you aren’t saying words we recognize. You are learning from your brother how to be a friendly, social person. Another wonderful development (wait for it….) You drink your milk from a cup!!!! Yay! One day you demanded milk and pointed to a sippy. So I filled the sippy and you drank it. Mama suggested giving the bottles away, which I plan to do. We’ve had a little resistance in the morning, but you are giving in. And growing up. Thank you for making the bottle-weaning business not-so-hard for Mommy. Mommy is very very grateful. Your movement-prodigy skills continue to amaze us. Now, not only do you ride a scooter, you do tricks on it. You can ride while lifting one leg behind you in an arabesque. You can ride leaning all the way back on your standing leg, while stretching your other leg behind you into what is essentially a split. You ride wiggling the handlebars quickly from side to side. I call it the weeble-wobble. And to stop the scooter, you put your foot down toe-top down on the ground and drag your leg elegantly behind you. It isn’t so great for your shoes, but it looks very fancy. Thank you for everything, my boy. We think you are the bee’s knees.